years, bringing our expertise and attention to detail to every job – large or small. 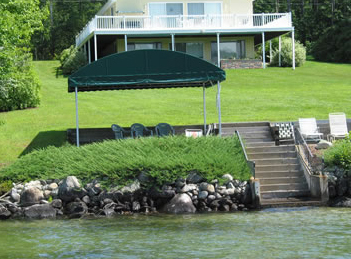 We design, fabricate, install and service custom awnings and canopies of every variety. Whether you’re looking for sun control, weather protection, temporary or permanent shelter or an aesthetic facelift, we’re ready to serve you. We’ll work closely with you to identify and prioritize your needs in creating the perfect solution to your problem. 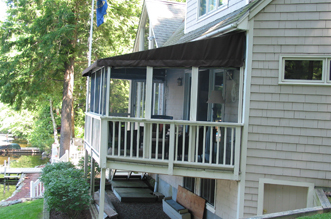 For the home, Image Awnings carries a full line of retractable awnings and sun control products. At the touch of a button, our electric motorized retractable awnings can provide shade, weather protection or even insect protection. With our own custom – made products, we can increase and improve your living spaces, shelter your deck or porch from the sun – even protect your boat as it sits at your dock! Not only are our awnings and canopies functional, but they also add to the look of your home – making you the envy of the neighborhood. For your business, Image Awnings is the solution to all your problems. If you’re looking for affordable signage, or want to improve on the curb appeal of your building, we can design a custom made awning sure to attract many customers. If you need to protect or increase your business space – seasonally or permanently – our full line of retractable and stationary awnings and canopies will provide a solution to your problems. 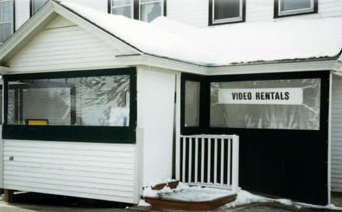 Image Awnings has been in business since 1988 – we pride ourselves on excellent products at an affordable price and superior customer service. We use only the finest materials and equipment available. Our attention to detail and quality are our number one priority. Call us today to see how we can add function, style and comfort to your home or business. We Fabricate and Install Custom Solar Screens and Shades, too!